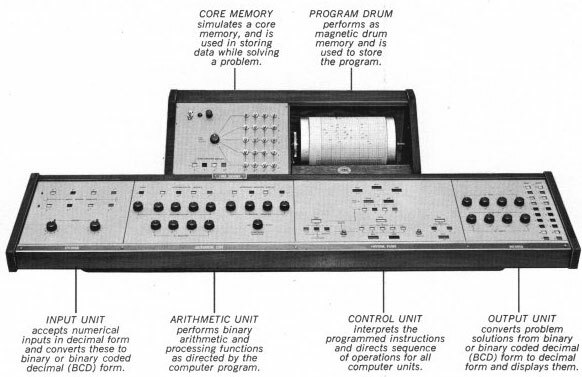 The Computer Trainer Model 650 (named also CT-650), developed by Irving Becker, was one of the earliest digital personal computers. Some sources list this computer as the Arkay CT-650, because like many who were involved with early computers, Irving Becker started off in radio and from 1945 was an owner of a company, specialized in manufacturing of radio kits—Arkay (after Radio Kits) International Co., located in Hicksville, NY. By the time that this computer was offered however, Becker has already changed (in 1965) the name of the company from Arkay International Co. to Comspace Corp.
By the 1960’s Irving Becker was developing many educational products, including the digital computer CT-650 and a cardboard kit for Bell Laboratories, called CARDIAC (a reference to its cardboard construction and the names of other kits like the popular Simon, Brainiac and Geniac of Edmund Berkeley). Irving was dedicated to education and even made a special version of the CT-650 that was made for blind students. Aside from Braille lettering, the bulbs under each light were extra strong so as to generate more heat, that way the student could “read” the results by feeling which lights were lit. 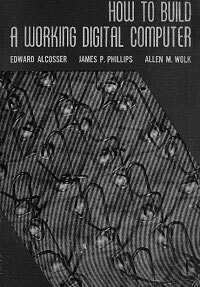 The CT-650 is sometimes called the paperclip computer, which is a reference to a very interesting 1967 book from Edward Alcosser, James P. Phillips and Allen M. Wolk (see the nearby image), entitled How To Build A Working Digital Computer. The book describes how to make a simple digital computer out of things one might find around the house, such as tin cans (for drum memory), screws, paperclips (for switches) and even wooden spools of thread. The design of the CT-650 seems to have relied on the book's plans and, therefore, it is called the paperclip computer. The CT-650 is easily programmed and has a versatile instruction set. The users may write their own programs, or oder existing or new programs from a library, called the Arkay Program Library. A small number of CT-650 devices were sold, the price was about $1000.